The VWAP axle weigh pads have long been at the forefront of axle weighing and at only 18mm high are the slimmest, lightest and most portable weigh pads available. A high strength aluminium alloy construction ensures impressive strength and robustness. The weigh pads have the option of two quick release access ramps or interlocking tracking and are highly portable with carry handles allowing them to be stored and carried to the weighing location when required. All VWAP models feature detachable cables for maximum portability and quick and easy servicing. 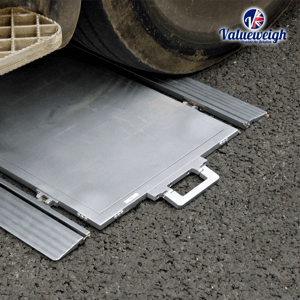 The weigh pads are sealed to protect against water and can be used for static or dynamic axle weighing. Standard, large and over-size models are available making the VWAP ideal for weighing all types of vehicles from cars to lorries. Contact Midweigh for your specific weigh pad requirements.